It is SRC- Secret Recipe Club day, and also officially the first day of autumn, my favorite season… As you can imagine, I am as happy as can be!!! I will be sharing with you a seasonal, guilt-free yet mouthwatering recipe: Apple Cider Baked Donuts with Maple Glaze. I have had these apple cider baked donuts for both breakfast and an afternoon treat… Oh, if you could only see the smile on my face — and my children’s faces as well!!! The recipe for these apple cider baked donuts has been adapted from Apple Cider and Cinnamon Baked Donuts by We Heart Vegan, the delicious vegan blog that I have been assigned for this month. I confess that vegan cuisine is something that I only came to learn about in culinary school, not something that I live by day to day. But the few vegan dishes that I have tried so far, I liked a lot. How better to learn more about this diet and philosophy on life than with Brittany, author of We Heart Vegan. 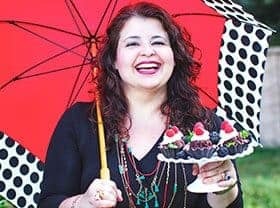 She has a bachelor of science degree in food and nutrition and a mission to educate others on how “good vegan food can not only be healthy but also cheap and appealing to everyone.” I highly recommend her blog! It was a difficult task for me to choose only one from among so many superb recipes. Because I did not have coconut flour, egg replacer, and vegan butter in my pantry and fridge, I had to replace them with all-purpose flour, real eggs, and unsalted butter. Instead of tossing these baked donuts in a premixed mixture of cinnamon and sugar as Brittany did, I drizzled them with maple glaze. Of course, you are welcome to try both my apple cider baked donuts with maple glaze or Brittany’s vegan apple cider and cinnamon baked donuts. Although my donuts are not vegan, they are guilt-free (small and baked which means they are both lower in calories and less fattening). I’d love to have your feedback!! For many other treats, visit the blogs featuring our SRC recipes below. Enjoy the marvelous autumn season and many of our fall goodies such as these Apple Cider Baked Donuts and our Candied Sweet Potatoes Cupcakes with Toasted Marshmallow Topping. 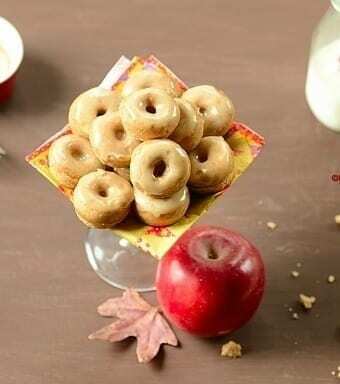 Delicious, guilt-free mini baked donuts which are both easy and quick to prepare. Preheat oven to 350 º F (177 º C). Using a tablespoon or a cookie scooper, spoon/scoop batter into a donut pan (3/4 full). Bake in the oven for 12-14 minutes (standard-size, yielding about 6 donuts) or for 6-7 minutes (mini baked donuts, yielding about 26), or until light brown and cooked through. Let cool for 2-3 minutes on a rack. Then, remove baked donuts from pan and place them directly on a rack to cool completely before dipping into glaze. Honestly I wanna grab those donuts out of my screen. Welcome to group C!!! I am happy that you have enjoyed my treat, Karen! Perfect for a Fall morning. I so want these for breakfast now! Oh, Lynne! They are great for breakfast — and as an afternoon treat as well. Now that’s what I call breakfast! 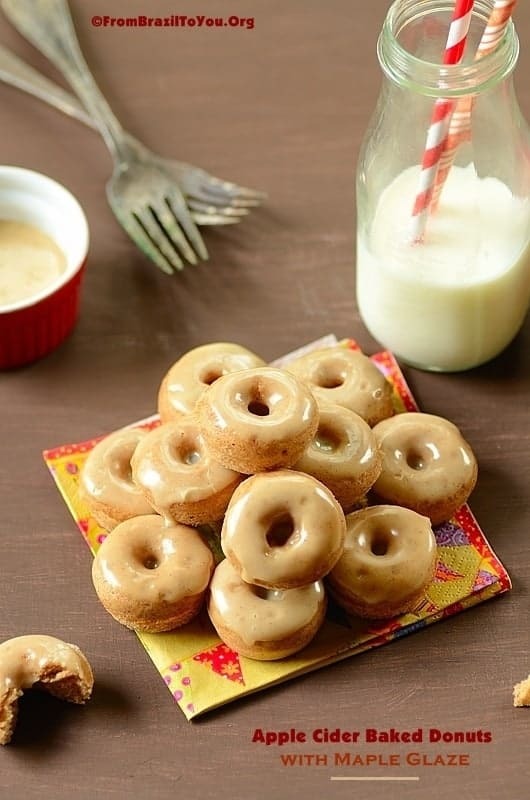 🙂 perhaps well have to make some of these this week.. My kids love their donuts and I usually make a lot to freeze for ahead of time as it is a great snack to quickly defrost and eat ! It sounds a great plan, Heather! I remember when I got We Heart Vegan, I was petrified because I’m a big carnivore. Ended up loving their recipes. The donuts look amazing, wish I had one for breakfast right now. We Heart Vegan has great recipes. It was hard for me to decide for only one. The perfect recipe to welcome fall. And they’re beautiful! I just bought a donut pan and can’t get enough donut recipes! This looks like a great one, I can’t wait to try it!! So perfect for this fall weather! Thanks, Cate, Please, try this recipe. You won’t regret it. Your donuts look heavenly! Perfect for fall. We just love anything maple so these sound perfect. Thanks! I’ve held off on all the apple & pumpkin recipes because I’m a summer girl (plus 80 degree weather and still getting tomatoes and zucchini in my CSA share wanted me to enjoy summer to the very end.) But now I’m ready and this will probably be the very first apple recipe I make for the season – pinning right now! Thanks, Deanna! I hope you make this recipe in a near future…It is a good one. Thanks also for sharing it! Thank you! My family and I really loved these donuts. They were gone in a blink of an eye. Loving the flavors of these baked donuts! And that maple glaze – I think I could drink it with a straw! These look ahhhhhhhmazing! I need one stat! Thanks so much for stopping by, Chelsy! I am getting on it asap. These are some delicious looking donuts. These look like irresistible bites of autumn goodness! I have peach cider in the fridge from a local orchard I believe I am going to try these with. Since the warm weather is not entertaining the whole “it’s fall”, I will have to try them twice….once with the peach and once with apple. Brilliant choice! Thanks a lot, Chris, for both stopping by and your sweet words. I hope you try this recipe. It became a family favorite. What pretty looking donuts, I love the cider glaze idea! Thanks, Nik! They are a comfort treat for sure. What a perfect donut to celebrate the entrance of the fall season! Glad to be part of SRC group C with you. Oh my this looks amazing. Apples and donuts- and a glaze? Perfect for fall. I should never have read this before lunch!!! I want them NOW! Spring or Fall, I know I could eat at least 10 a day. Just gorgeous! Perfect treat to user in the fall! Your donuts look delish!!! I like your thinking Denise! I’ll gladly have an Apple Cider Baked Donut with the fabulous Maple Glaze for both breakfast and snack time! An irresistible recipe to welcome fall! What a delicious way to welcome the new season,Denise. I just happen to have some cider in my fridge. Coincidence? I dont’ think so!! These look soooo tasty. I do not used to make donuts because the grease, and each time I see a recipe of baked donuts I only wish the pan…!!! I could totally use this for breakfast right now! It’s so good to have your visit. I enjoy eat them anytime of the day. Although delish, they are not too sweet. They go well at breakfast time for sure! Thanks, Nami! It was my first time baking donuts as well…I loved it so much that I intend to make them again and again. Wow, donuts intimidate me to no end! What a beautiful post, and absolutely great job making these beauties! Mrs. Miller: What a great surprise!!! Thank you for stopping by. I am glad to know that you enjoyed the donuts so much that you intend to make them for your family. Have a happy weekend! Love these! These donuts were so delicious! I am so excited that I discovered your blog. I can’t wait to try more recipes. Thank you for letting us sample. Thank you, Mrs. Jeske, for stopping by. I am glad that you enjoyed these donuts. 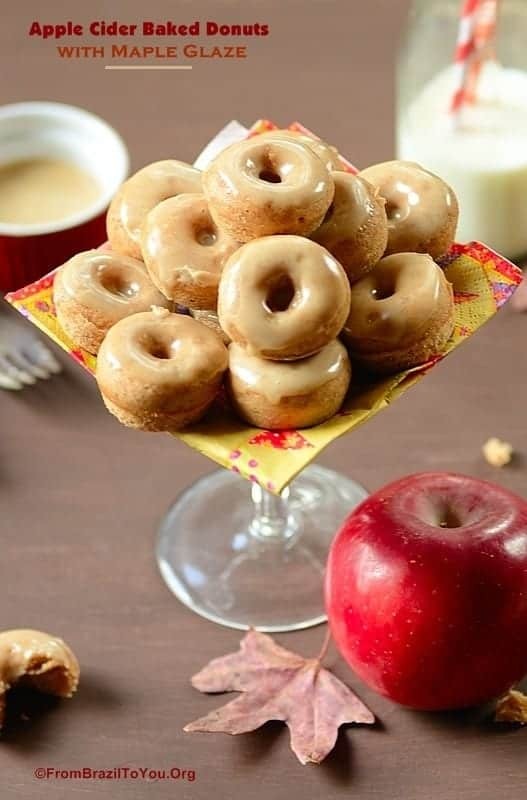 We have a Fall gathering coming up and the hostess was searching for an apple cider donut recipe so I am sending her this one. It looks straightforward and so yummy. Living here in New England, we will love the addition of the maple glaze, oh my! Found this on Pinterest and had to stop by and comment. Thanks! Thank you for stopping by. This recipe is pretty easy to make and yummy –a real family favorite! I hope y’all enjoy these donuts and have a very happy season.